Tacoma stans ‘Yellow elder’, watercolor by Jude Wiesenfeld on 140 lb. Arches 11” x 14”, © 2018. Completed July 2018. It’s not too early to start planning for next year! 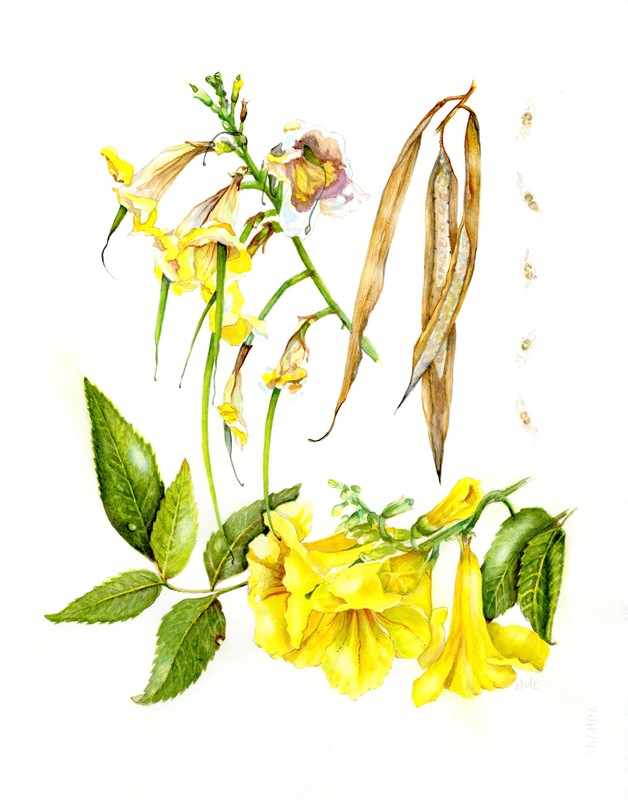 Join BAGSC member Jude Wiesenfeld for her three-day Botanical Art Workshop: Watercolor on Paper, at the Desert Art Center in Palm Springs, California, January 25, 26, and 27, 2019. The cost for the three-day workshop is $200US. 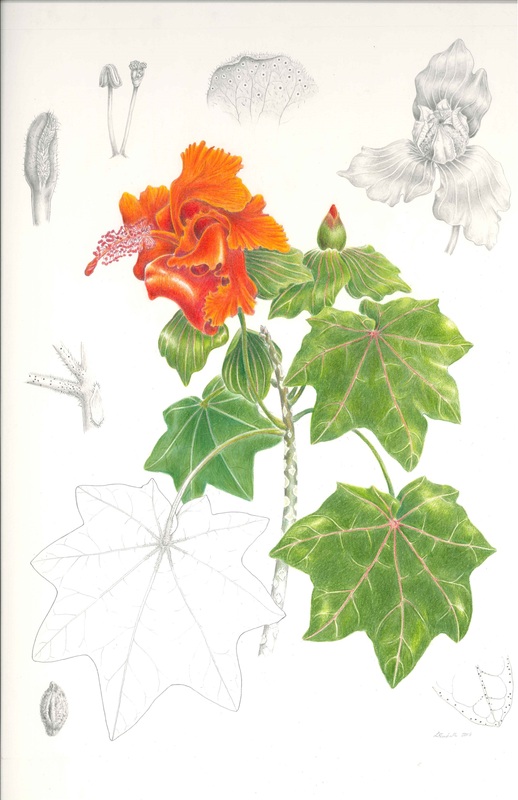 This workshop will be an introduction to botanical art for everyone with some prior experience with watercolor. All participants will begin a painting while learning about the history of botanical art, basic plant and leaf shapes, creating studies and notes about a subject, and masking and composition. 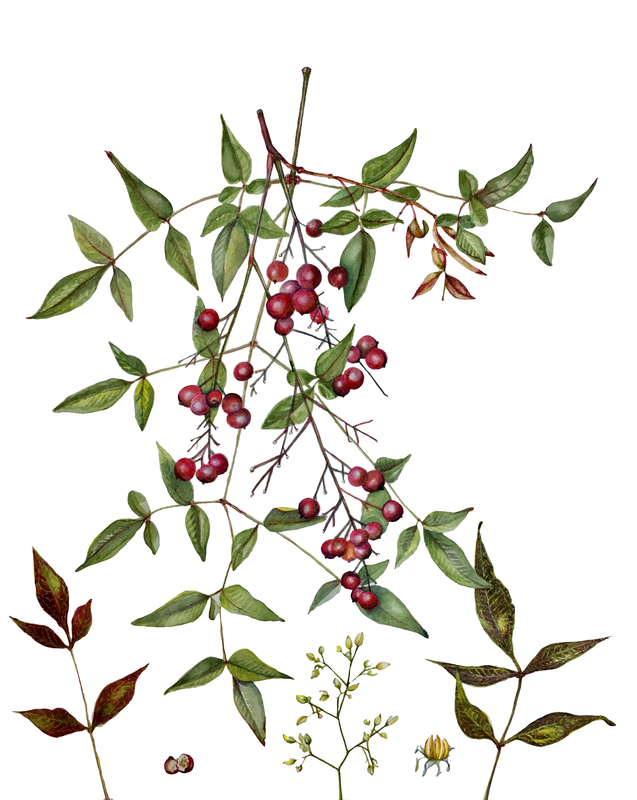 Nandina domestica, Sacred Bamboo, by Jude Wiesenfeld. Watercolor on 140 lb. Arches, 18.5″ X 15”, © 2017. This is not a BAGSC-sponsored workshop—enrollment is directly through the instructor. To enroll: email Jude Wiesenfeld and send a $50 non-refundable deposit (address will be supplied upon sign-up) by January 18, 2019 to reserve your spot. Payment balance will be collected the first day of the workshop. 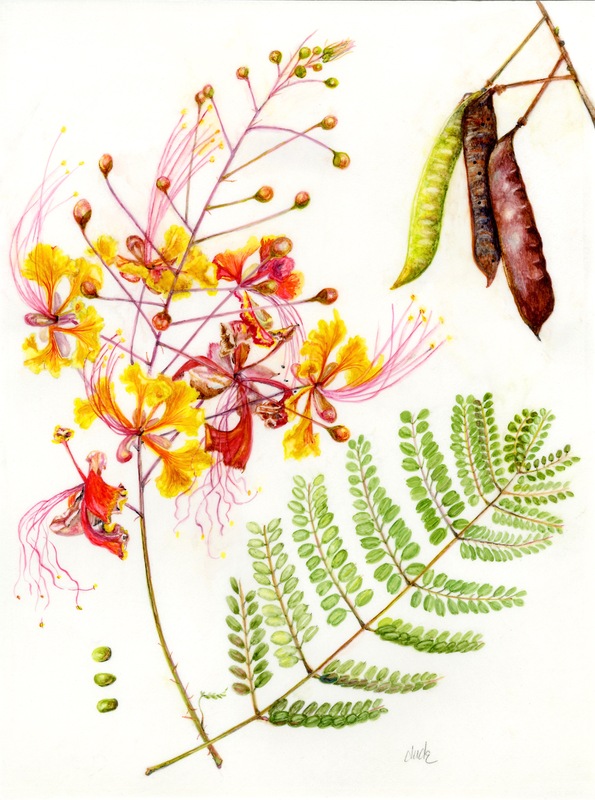 Caesalpinia pulcherrima ‘Pride of Barbados’ by Jude Wiesenfeld. Watercolor on Kelmscott Vellum, 9″ X 12″, Completed March 2018. The materials list is available on the workshop flyer, downloadable here. The Desert Art Center is located at: 550 N. Palm Canyon Dr., Palm Springs, CA 92262, 760 323-7973. Directions and hours can be found on their website. Kokia drynarioides, Hau hele ‘ula. Lesley B Randall, color pencil and graphite on cold press illustration board. Scale 1:1 and various for enlarged details, © 2015, all rights reserved. BAGSC’s exhibition “Totally Tropical,” opens Saturday, November 3, 2018, at the San Diego Botanic Garden (SDBG) in the Ecke Building. “Totally Tropical” celebrates the opening of the San Diego Botanical Garden’s tropical conservatory this past summer. Seventeen BAGSC members are exhibiting 32 paintings of plants that grow in tropical climates in this non-juried exhibition. Originals and archival giclée prints will be shown. Artists include Natalia Alatortseva, Margaret Best, Melanie Campbell-Carter, Diane Nelson Daly, Catherine Dellor, Steve Hampson, Janice Sharp Hoiberg, Mary Jansen, Suz Landay, Arillyn Moran-Lawrence, Terri Munroe, Marilyn Anne Parrino, Lesley B Randall, Veronica Raymond, Kirsten Rindal, Deborah B Shaw, and Leslie Walker. A casual reception will be held from 2:30 to 5:00 pm, Saturday, November 3, to celebrate the opening! Some of the artwork is for sale; ten percent of all sales will be donated to support SDBG. 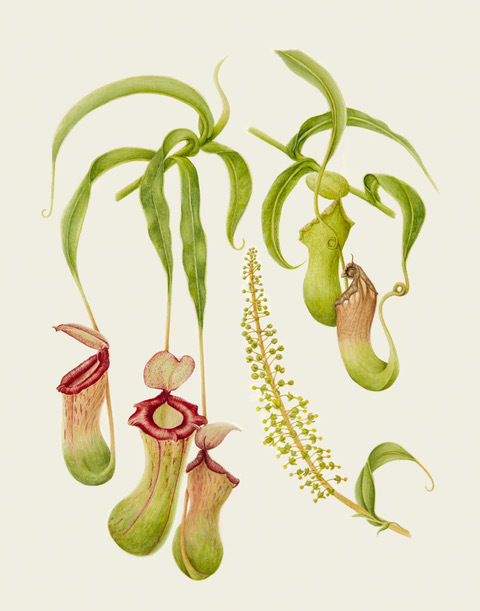 Nepenthes ventricosa Blanco, watercolor on paper, Kirsten Rindall. Scale 1:1, © 2017, all rights reserved. As usual for SDBG exhibitions, BAGSC will install the exhibition the same day as the opening. All BAGSC members are welcome to come join in the installation, assist with the hanging, and see the amazing gardens. BAGSC members, friends, family, SDBG staff and the public are all welcome to join us for the opening reception. The San Diego Botanic Garden is located at 230 Quail Gardens Drive, Encinitas, CA 92024. The garden covers approximately 35 acres; hours, admission, and information can be found on their website.